Last revised 6 January 2012. A thermal blanket is seen on the right in flight toward a narrow miss of the ALSEP experiments. A smaller object on the left is headed in the direction of the LRRR. Frame from the 16mm DAC film taken out the LMP's window 3.25 seconds after first ascent stage motion. The blanket will impact the surface about 10-12 meters north of the Central Station at about 6.8 seconds. During all the Apollo LM liftoffs, the ascent engine exhaust propelled fragments of desent stage insulation in all directions and, in some cases, large, lightweight objects were thrown distances of over 100 meters at velocities of about 20 meters per second before striking the lunar surface and, eventually, coming to rest. 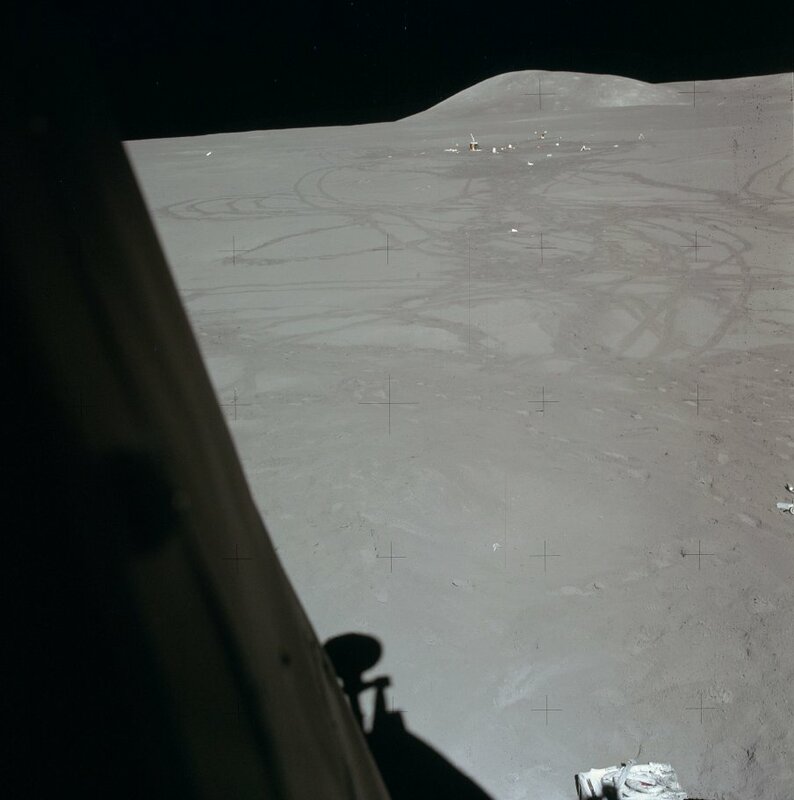 A spectacular example was an Apollo 15 thermal blanket which took flight from the vicinity of the MESA about 1.3 seconds after first ascent stage motion. 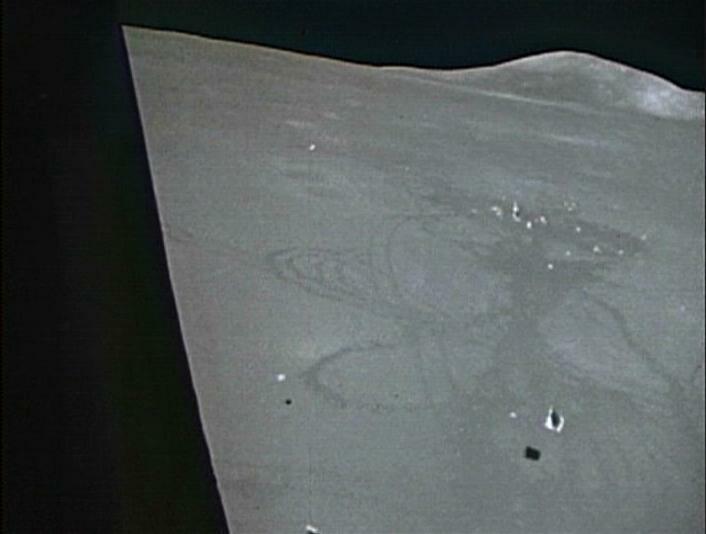 About 5.5 seconds later, after about 110 meters of flight at an average ground speed of 20 m/s, the blanket struck the lunar surface about 11 meters north of the ALSEP Central Station. During the impact, it created a short-lived dark mark (lofted dust?) about three meters long and a half meter wide before bouncing/rolling farther away from the LM, finally coming to rest about 70 meters beyond the Central Station. Had the blanket hit the Central Station, it seems likely that, at the very least, the antenna would have been knocked out of alignment with a consequent loss of data. (1) During final crew activities on the surface, secure or stow any debris which could be a hazard to long-term experiments or structures. (2) Ensure that landing areas are sufficiently far from experiment sites and structures. In the case of the Apollo LM, an adequate separation would have been something in excess of 200 m (subject top analysis of other liftoff films). We have two visual records of the Apollo 15 LM liftoff: the 12 frame-per-second (fps), 16mm DAC film shot out the LMP's window and the 30 fps TV record. For convenience we can define the start of liftoff as the first occurrence of sustained, upward motion of the ascent stage. Ken Glover has used the 60 fps version of the TV record on the Spacecraft Films Apollo 15 DVD set (Disk 6) to capture 20 successive frames ending with the first spacecraft motion. The third and fourth frames show a red glow at the base of the ascent stage, while the fifth shows more extensive blue cloud in the same area. Both may be related to stage separation. For the purposes of the following discussion, we can call the 16-mm frame showing first sustained upward displacement 'frame16-00'. In the 16mm film, the thermal blanket is first visible at the bottom of frame16-23, which is about 1.9 seconds after first spacecraft motion. Frame16-24 is the second of the 16-mm frames showing a thermal blanket flying away from the LM from the vicinity of the MESA. This frame was taken about 2.0 seconds after first spacecraft motion. Just beyond the blanket, note the edge of the continuous area of darker, disturbed lunar soil that is about 20 meters out from the MESA. See, also, pre-launch window photo AS15-88-11951. In frame16-28 (2.33 seconds), the blanket and its shadow are seen crossing the outer edge of the disturbed area out in front of the LM. This edge is about 20 meters from the MESA. If we assume that the blanket accelerated quickly to its final speed and that its subsequent motion wasn't signifcantly influenced by the ascent engine exhaust, we can estimate that it took flight roughly 1.3 seconds after first spacecraft motion, perhaps because, prior to that time, the blanket was shielded from much of the engine exhaust by the bulk of the descent stage. At about the presumed time that the blanket took flight, frameTV-40 in the TV record shows that the Ascent Stage had risen about it's own height and was accelerating rapidly upward. Close examination of the 16mm film indicates that the blanket impacts the surface just north of the Central Station about 6.9 seconds after first spacecraft motion and about 5.6 seconds after the blanket's presumed launch from the MESA. The distance flown is about 110 meters, giving a ground speed of about 20 m/s. The launch elevation angle, A, is approximated by sin A = t g / 2 V where t is the time of flight (5.6 seconds), g is lunar gravity (1.62 m/s/s), and V is the ground speed (20 m/s). These values give A = 13 degrees. Film strip of the blanket in flight. Note that the frames are not evenly spaced in time. Click anywhere on the strip for a larger version. (1) Frame16-27 (2.25 seconds) A comparison with Frame 16-24 (above) and subsequent frames in this strip shows that various tumbling motions were imparted to the blanket during launch. Because the Moon has no atmosphere, these motions will persist until impact at the ALSEP site. ; (2) Frame16-29 (2.42 seconds) Note the change in blanket orientation and the separate piece of debris on the left, moving in the general direction of the LRRR; (3) Frame16-39 (3.25 seconds) The blanket has been inflight for about 2 seconds and has flown roughly 40 meters from the MESA. It's current height above the ground is about 5.75 m; (4) Frame16-60 (5.00 seconds) The blanket has been in flight for about 3.7 seconds, is about 72 meters from the MESA, and about 5.5 meters up, starting its ballistic descent; (5) Frame16-63 (5.25 seconds) Changes in LM orientation are about to take the blanket out of the field-of-view for a short time. The blanket is now about 5.1 meters above the surface; Frame 16-78 (6.5 seconds) The blanket is passing 2-3 meters north of the Heat-Flow Experiment module at a height of perhaps 1.5 meters. Note that the piece of debris flying toward the LRRR is still off the ground; (6) Frame16-82 (6.83 seconds) The impact has begun; (7) Frame16-87 (7.25 seconds) The blanket's shadow is visible again, suggesting that it is in flight again. 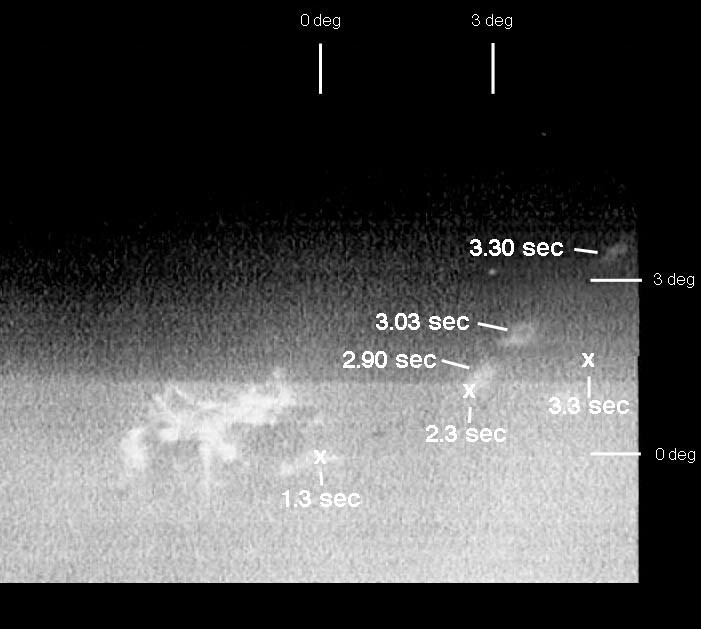 The dark mark created during the impact is about 3 meters long and 0.5 meters wide; (8) Frame 16-90 (7.50 seconds) The blanket is definitely in flight; (9) Frame16-106 (8.82 seconds) The dark mark made during the impact seems more indistinct, suggesting that it represented shadowing by lofted dust. The LM's shadow is now in the field-of-view; (10) This frame from the 16mm film shows the final resting place of the blanket and, also, a portion of the Descent Stage. The TV record has been examined for evidence of the blanket in flight, but no unambiguous identifications have been made. Part of the difficulty is undoubtedly the bright background for the portion of the trajectory below the apparent horizon. In addition, dust kicked up by the ascent engine washes out the scene. At about 2.9 seconds, a bright patch appears to rise above the apparent horizon to the right of the descent stage, reaching the righthand edge of the field-of-view at about 3.3 seconds. 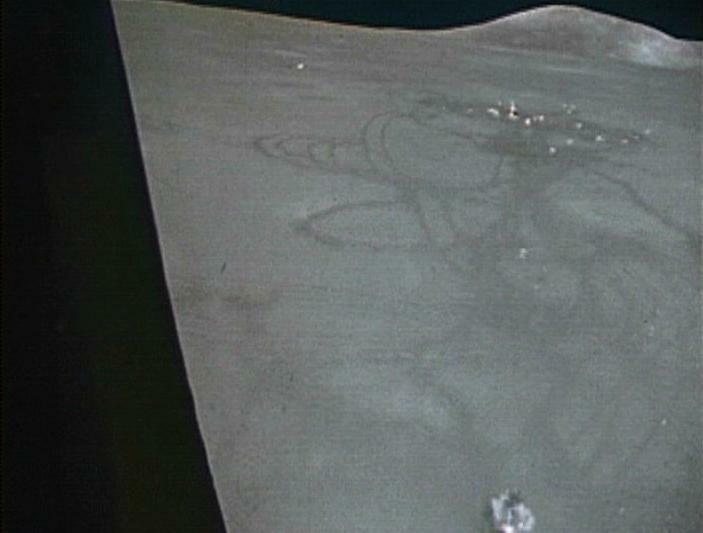 Given that the blanket leaves the vicinity of the MESA on an azimuth about 24 degrees north of west and an elevation of about 13 degrees, its ballistic trajectory can be superimposed on the TV image and compared with the bright patch. That comparison makes it unlikely that the bright patch is the blanket. If the bright patch corresponds to a physical object, rather than a reflection in the TV camera or some other phenomenon, it does not enter the field-of-view of the 16mm camera. Three TV frames have been combined to show the apparent motion of a bright patch that appears above the apparent horizon at 2.9 seconds after first spacecraft motion and reaches the righthand edge of the TV field-of-view at about 3.3 seconds. Approximate angular scales are shown on the righthand and top edges and are derived from the fact that the TV is about 160 meters from the LM and that the separation of the north and south footpads is about 11 meters. For comparison, projected positions (Xs) are given for the thermal blanket at 1.3 seconds (the presumed launch time), 2.3 and 3.3 seconds. As expected from the 13 degree launch elevation angle, the projected blanket trajectory is much shallower than that of the bright patch.